At JavaOne 2009 during James Gosling's Toy Show, Tor Norbye demonstrated the current state of the long-awaited JavaFX Authoring Tool. The ability to position/orient a node (e.g. an image) in multiple places on the stage, each corresponding with a point in time on a timeline (represented by a slider). Each point in time becomes a KeyFrame, and interpolations are calculated based upon position/orientation. Dragging the slider results in seeing the node move and rotate through the positions in which the node was placed. I assume that scaling and other transforms will be supported in the tool as well. Tor mentioned that various interpolations are supported (LINEAR, EASEIN, EASEOUT, and EASEBOTH). I assume that spline interpolation will be supported as well. Placing UI controls on the stage, hooking them up with event handlers, as well as binding to instance variable values (e.g. in other UI controls). Targeting an application at multiple screens (e.g. desktop, mobile phones), with the ability to customize for each screen. Augusto Sellhorn (AKA sellmic) has compiled some video clips and his thoughts about the JavaFX Authoring Tool in a blog post. If you didn't see the Toy Show, checking out Augusto's post is a quick way of seeing the preview of the tool. 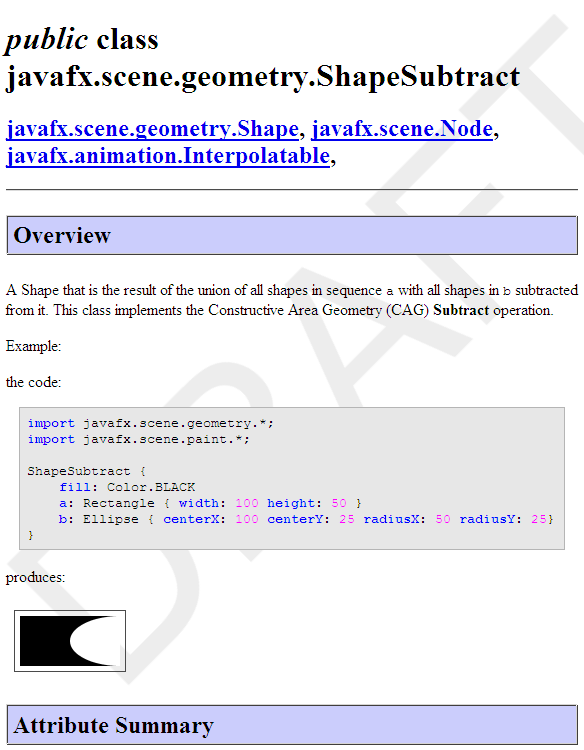 Update June 13, 2009: Augusto created another blog post with new screenshots, links and thoughts on the JavaFX Authoring Tool. It is often desirable to have at least part of a JavaFX program's model represented by Java objects. The problem is that JavaFX programs can't bind to plain old Java objects (POJOs) yet. Some workarounds have been suggested, one of them articulated by Magnus Robertsson of jayway. Magnus has created an open source tool called javafxbinder that utilizes Aspect-Oriented Programming, and PropertyChangeListener functions, to keep a JavaFX object updated when mutator functions in a POJO are called. Nice MOJO, Magnus! On a related note, I'll be speaking at Øredev (founded by jayway and some other "ways": dotway, leadway, testway and realway) which will be held in Malmö, Sweden on 2-6 November, 2009. Hope to see you there! JavaFX Skins Game, and Happy New Year! First of all, I would like to wish you a Happy and Blessed New Year! I'm excited about the momentum that JavaFX has achieved since its 1.0 release in December 2008, and about its increased adoption for RIA and mobile development in 2009. Also, I'd like to introduce Dean Iverson, the author of today's article, who for many of you needs no introduction because he's been active in the Java/Swing/JavaFX community for some time now. Dean will be a regular contributor to the JavaFXpert blog, as well as to the JFXtras project that he mentions in todays article. Simon Morris, author of the upcoming JavaFX in Action book, has just written a very informative post on his blog. He shows how to create a custom progress bar that is skinnable using JavaFX's support for CSS. It's definitely worth a read. Using CSS you can customize just about every aspect of the rectangles that Simon uses in his progress meter: their size, color, even how many there are! It's the ultimate in flexibility. We just use the shape's corner arc attributes to set the upper-left and lower-right corners as arcs with a radius of 80 pixels. We then set the other corners to be square by using an arc size of 0. So how do we use this new shape in Simon's progress meter? First, we create a new skin class. It will be almost exactly the same as Simon's, but it will use the new shape. Simon's original code used the following CSS to style the three different progress meters in his sample program. This stylesheet produced the three progress meters in Simon's original example. All we have to do to use our new skin is to add a new CSS selector. In this case I want to change the skin of the progress meter with the id of testId. So I'll add a new selector just above the existing one that applies the new skin. And voila, we have a new progress meter! Notice that the middle meter (whose id is testId) is the only one that changed. Click the Java Web Start Launch icon below to see it in action. I have used the fully qualified path name for the VariableCornerProgressSkin class in the selector's skin declaration. In this case, the class is located in my javafx_css package. It is important that the selector with the skin: declaration be a separate selector and be placed above any other selectors that match the same control. Otherwise all of the style declarations will be applied to the original skin instead of the new one. Apparently the skin is only replaced after the entire selector is parsed so any styles contained within the same selector will be applied to the existing skin rather than the new one. Thanks again to Simon Morris for the original example! JFXtras is an open-source project that helps fill in some of the gaps of the JavaFX 1.0 Release. The JFXtras project is led by Stephen Chin (co-author of the upcoming Pro JavaFX book) and it includes support for Dialogs, Grid Layouts, Unit Testing, and an Asynchronous Worker class. You can download the 0.1 release, peruse the Javadoc online, and sign-up for the mailing list, all on the Google Code project site. Dialogs - The JFXtra Dialog provides a drop-in replacement for a Stage that will pop-up a real Java Dialog. This includes support for an owner window, modality, alwaysOnTop, the ability to hide the taskbar icon, and many other features. Layouts - The JFXtra Grid provides an advanced layout container (example shown above) that can be used for JavaFX nodes and wrapped swing components. Testing - JFXtras provides a declarative Unit Testing facility that allows you to do write JavaFX tests in the JavaFX language. It is modeled after best-of-class behavior-driven and fluent testing patterns to make tests easier to read and maintain. Asynchronous Worker - Working on the theory that developers deserve their share of rope, JFXtras provides an asynchronous worker wrapper that allows you to execute pure JavaFX code on a background thread. Stephen Chin's recent blog post on JFXtras provides some background on the project. Jeff Martin of ReportMill Software has been involved with the JavaFX community since the beginning. ReportMill has been working on a GUI builder tool for JavaFX named JFXBuilder, and has given the community a peek from time to time. Each time, I've kicked the tires a bit, but haven't felt that it was ready for prime time. Generate JavaFX code on the fly"
As I dragged the mouse on the trackball shown above in the lower-right corner, the perspective of the 3D bar graph changed accordingly. I was not expecting that level of sophistication, given that JavaFX SDK 1.0 was released only two weeks ago. I haven't experimented much with JFXBuilder, and I don't know anything about their licensing-related plans yet, but wanted to give you a heads-up that this looks seriously cool to me so far. Jeff Martin or someone from ReportMill: If you read this, would you leaving a comment and/or link about your licensing-related plans for JFXBuilder? According to Josh Marinacci of Sun on a Java Posse thread: "We (Sun) have an early release of an Eclipse plugin for JavaFX up on Kenai." Please join me in checking it out and let me know what your experiences are with this early release Eclipse plugin for JavaFX! On a related note, Weiqi Gao shows us how to make the JavaFX 1.0 plugin for NetBeans 6.5 work on Linux! Try your hand at the "Breakout" style game that Sten posted on his blog, and then read about how he collaborated with a graphic designer (his four-year-old daughter) to create this game in JavaFX. Sten discusses in his post how he used Project Nile to export graphics-related JavaFX code from Adobe Illustrator using Project Nile. According to an explanation by Josh Marinacci of Sun, "One of the innovations in the JavaFX toolchain is our new javafxdoc tool. Rather than producing a set of html files like regular 'javadoc' does, we produce a single large XML file representing the entire codebase's API. This lets us easily add extra processing steps, such as producing semantic well-formed XHTML as you see today. It also lets us do a few other things. Last time I mentioned custom doclet tags for things like default value and read only. Now we've added inline examples. * It's time consuming, so we do less of it. * The screenshots can get quickly out of date. * The code snippets aren't syntax highlighted. With our new inline examples system all of these are taken care of. Just use the @example doc tag and the rest will be taken care of for you. The doc tool will compile and run your code into a buffered image. Then it will insert nicely syntax highlighted code back into the final page along with a link to the screenshot." Will produce the page you see in the screenshot above. This XML file is a database of a project's attributes, which can not only be data-mined to improve documentation, but to support many other tools. For example, a cscope-like source navigator is more easily done than the original tool, as the XML model has more useful information about the source." The ease of creating examples that are in-line with the documentation should encourage development of these examples, both in the JavaFX library API as well as in documentation that you and I as developers create for our projects. Thanks Josh and the JavaFX development team for this facility!